Welcome to the "Old" WaterTribeTM web site. Minnesota Kruger Challenge 2019 Launches In: 141 Days, 20 Hours, 11 Min. Minnesota Voyageurs Challenge 2019 Launches In: 141 Days, 20 Hours, 52 Min. Minnesota Moose Lake Challenge 2019 Launches In: 143 Days, 21 Hours, 11 Min. Learn proven health-promoting strategies from those who seek out adversity. The men and women who are members of WaterTribe remain healthy despite severe sleep deprivation, the risk of hypothermia, and a variety of environmental hazards. Three Disk Set: DVD, Audio CD, and Pelican's Poop. The story of Sharkchow's 2006 participation in the Ultimate Florida Challenge. Coming to a bookstore near you. June 8, 2010. Due in bookstores and on Amazon.com June 8, 2010. Jenning has a second version of the EPIC Ultimate Florida Challenge. This is a two DVD set. The first DVD is the same as the first release. But the second DVD contains two very interesting interviews. First, SharkChow has a long interview giving many details and insights into his impressive win of the first WaterTribe Ultimate Florida Challenge in 2006. His hint about using the tides on the St. Marys river is worth the price all by itself if you are thinking of doing the UFC yourself. Note: this is really a voice recording - no video. Next there is a shorter video interview of ThereAndBackAgain (aka TABA). TABA isn't a complainer so he had never mentioned many of the real issues he faces in these challenges. This interview opened my eyes and prompted some minimal changes to make things just a bit more fair. Special Note: The proceeds all go direct to Jenning. Making this DVD took untold amounts of money and time. This would make a nice preview for the UF2010 event. "The purpose of WaterTribe is to encourage the development of boats, equipment, skills, and human athletic performance for safe and efficient coastal cruising using minimal impact human and wind powered watercraft based on kayaks, canoes, and small sailboats." How far could you go in a small boat? Maybe further than you think. From International Falls to Grand Portage along the Minnesota/Canada Border. From Crane Lake in Voyageurs National Park to Grand Portage along the Minnesota/Canada Border. From Moose Lake in the BWCA to Grand Portage along the Minnesota/Canada Border. This bootcamp is aimed at newbies (but all WaterTribers are welcome) to provide some initial words of wisdom and a fun time in the Tampa bay area. Tampa Bay to Key Largo,Florida, 300 miles in 8 days or less. 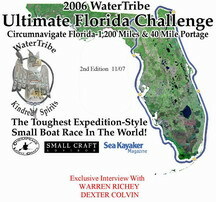 This Challenge is an expediton style adventure race for kayaks, canoes, and small sailboats. The time limit is 8 days but the winners will do it in 2 to 4 days. The distance is 260 to 300 miles depending on your course. This challenge is a qualifier for the Ultimate Florida Challenge. This ultra marathon starts at Fort Desoto as part of the Everglades Challenge. It finishes near Stump Pass at Cape Haze Marina in Englewood, Florida a distance of roughly 64 miles. There is a 35 hour time limit. Winners can usually finish within 24 hours, and most can finish on Sunday. Weekend Warriors - this is your challenge! This Ultimate Challenge is an expedition-style adventure race for kayaks, canoes, and small sailboats. The race circumnavigates Florida and covers roughly 1200 miles including a 40-mile portage connecting the St. Marys River to the Suwannee River. There are five stages with the first stage being the Everglades Challenge. There are special rules that apply to the portage for class 4 boats so all WaterTribe classes and divisions can participate.